Once again, a new day for those who travel in the service of others. 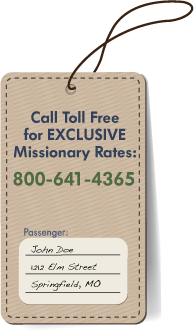 During the 1990’s travel designated religious, mission oriented or philanthropic went through its most serious structural changes then at any time since air travel was introduced. US based organizations finally found a voice to represent them, here, within our borders that was not European based. This new organization also allowed airlines to define, understand and develop this live segment right here in their area of sale while helping to fashion the features and benefits of the products engineered specifically for this specialized consumer. This need to connect consumers and suppliers was instrumental in creating the World InService program in the USA. Working centrally, hand in hand with suppliers our efforts unified this valuable segment providing new product features that helped our suppliers increase sales without engaging in across the board discounting. In fact, in many cases yields improved over previous contracts which were geared for consolidators and the grey market more than fitting the specific needs for flexibility required by so many mission and non-profit organizations. The partnership that forged this strong program involved over 45 travel agencies throughout the United States who had a long history of servicing these organizations for many, many years. We combined this front line distribution with Magical Holidays expertise in creating and administering specialized air products for many hard to reach and hard to service niche segments. This is how we founded InService USA in the early 1990’s. Our concept of merging area of sale supplier input, front line distribution indigenous to the segment, and administrative integrity sent some shock waves through this small and focused segment, very quickly. It wasn’t long until Raptim, Europe’s dominant company servicing Mission related travel because very interested in our activities and became a partner in our program. Our development efforts entailed the roll out of a sophisticated and detailed consumer identification program that would help everyone recognize the InService traveler and assist them in delivering the appropriate benefits to them. For the very first time airlines were able to see that their discounts were delivered to individuals who were entitled and could track them back through an established and recognized agency system to their sponsoring organization. The free flow of information for the first time gave airlines, organizational / consumer / agency information all at one time. It was a direct reflection of our partnership vision at that time. During our brief history we had delivered tens of millions of dollars of revenue production via our RAPTIM/World InService organization. Many airlines relegated control of the Mission segment to us so we could work with agents and organizations to ensure that only the proper outlets were authorized to distribute these products. Over time however, our partners went through changes of their own basically evolving from wholesalers and administrators of this program to retailers, who in many cases would be competing with the very distribution system we set up under our program. Agents became wary of providing information that could be seen to disclose confidential account data to our organization in fear of losing their accounts to these newly forged competitors. This is where the state of the Mission/Non-profit segment has stayed for the last ten years running. No real innovation to help marry supplier and consumer and no real conduit available to help that to happen. Most of the recognized distributors in this area are ineffective as they are principally retailers and as such will never retrieve accurate information on organizations from any viable subagents. We believe, as we always have, that it is important for suppliers to work through an intermediary who represents the needs of this valuable segment, but at the same time can act with a level of integrity that is recognized by the numerous and valuable agents servicing these travelers. Our history and understanding of the InService segment makes us unique in this marketplace. We are alone as the innovators that brought control of this segment to suppliers here in the USA and we feel now is the time for us to reinvigorate this market with our presence..
• Validation of the identity of both traveler and organization. • Negotiate features and benefits specifically for this segment. • Pursue distribution through localized outlets.